How low can president Buhari and his flagrant APC members go in their fight to defeat Niger Delta Avengers(NDA)? From Buhari moving all his Armed Forces to fight Niger delta avengers, to the unjust killings of civilians in Niger Delta, from formulating different stories with some disreputable media house in Nigeria (Eg. Sahara Reporters) on how some fake Niger Delta Avengers members were caught, to Buhari begging Niger Delta to stop the bombings of pipelines. From saying the Nigeria government won't dialogue with Niger Delta Avengers (NDA), to paying over $200million dollars to Saudi 'Blackwater Mercenaries' to fight Niger Delta Avengers (NDA). Lies upon lies, all in the name of securing the oil wells in Biafra land for Northerner politicians. 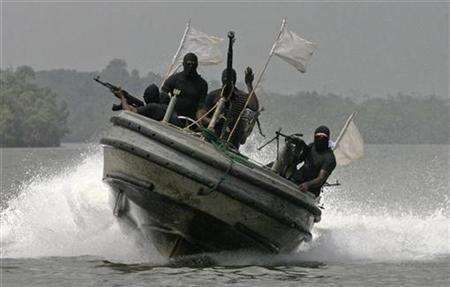 Just recently, some groups of shameless media house in Nigeria said Niger Delta Avengers have splitted and were gunning for each other but shortly after that news was debunked by FAMILY WRITERS, they are now parading another falsified news that Former President Jonathan, Tompolo, Akpabio, Wike, Dokpesi and co are the Sponsors Of Niger Delta Avengers. How hysterical! What next will Buhari and APC come up with? Probably they will say Russia are the reason why there is division in Nigeria or Donald Trump is the key sponsor of Biafra? What a reprehensible way to deal issues. Its very alarming that the Buhari's administration is the most humiliating, notorious and despicable government ever in Nigeria. In less than two(2)year into the alleged Buhari's administration, unspeakable things all ending in disasters has occurred. President Buhari have moved from one crisis to another, from one allegations to another, from one family scandal to another, from one international law violation to another, from one brutality to another, from one conflict to another. Its very important that the general public take note of this discreditable agendas by president Buhari and his corrupt APC crew. All these lies and propagandas are just strategies to divert and deflect the attention of Nigerians from their level of incompetence. How degrading! Also been mindful of where you blog and read your News from, some shameless Media who ought to report the truth for you readers, have already sold their integrity to Nigeria politicians. Don't believe everything the Nigeria government tells you and quit reading from their obscene media house. the zoo and their lies!